Toys that kids now have today may be considered quite complex and sophisticated. They also provide kids with some added mental stimulation essential for their growth and development. A toy like the Kidz Robotix Spider Robot is one example. The new Kidz Robotix Spider Robot is a construction kit that will enable kids to build their own robotic spider. This robot spider climbs up and down the string on its own. The set includes all the materials needed to build the robotic spider as well as the step-by-step instructions on how to build it, all except the screwdriver and the batteries needed, that is. There are 22 mechanical parts that kids will learn how to put together. 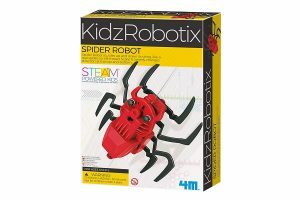 The Kidz Robotix Spider Robot provides kids with a good S.T.E.A.M. learning experience. It also helps them develop their fine motor skills, logic, spatial reasoning, and problem solving abilities. It also helps kids build their confidence in starting and completing such a project at a very early age. The Kidz Robotix Spider Robot kit is ideal for kids from 8 years old and above. It is available at Fat Brain Toys for $17.